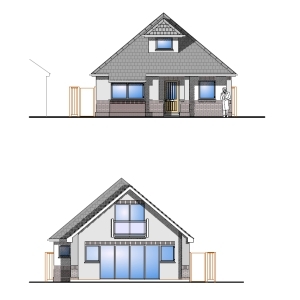 East Dorset District Council: Matt Annen is pleased to announce that planning permission was secured last week for an infill development on an existing large site in West Parley to create an additional detached three bedroom chalet. The applicant approached Pure Town Planning for advice as they had seen the plot and felt that the spacious side garden was well suited for an additional detached property. After we visited the site and assessed the wider street scene it became clear that the plot represented an excellent development opportunity. Whilst there were no other examples of sub-divisions in the road we felt that an infill proposal here would not detrimentally impact on the rhythm or spacing of dwellings in the locality and thus be comfortably accommodated into the street scene. An initial application for a similar (albeit larger) dwelling on this site was refused. However following receipt of the case officer’s report detailing the reasoning for refusal, Pure Town Planning along with The Plan Partnership who prepared the drawings reviewed the comments and worked together to address all of the previous concerns which resulted in the amended scheme receiving a recommendation to GRANT. The officer considered that the site was in the urban area where the principle of development is accepted. The proposed dwelling was for a 3 bedroom dwelling which met a local housing need. She deemed that the amended design with hipped roof form, modest hipped roof front dormer and front canopy complements and references characteristics of other properties in the road overcoming a concern of the previous proposal. This revised scheme was set back further off the side boundary so that a 3m gap is maintained between the new house and it’s neighbour. Furthermore the removal of previously proposed dormers, the bulk of which was deemed to have had an overbearing impact on the outlook from the neighbour, together with the amended siting and the reduced eaves height and new hipped roof form was considered to overcome previous concerns in relation to neighbouring amenity. Because the Parish Council raised an objection to the scheme the application was required to be determined at January’s Planning Committee. The majority of the Councilors agreed with Matt’s deputation that this was a great opportunity to provide a high quality family house in a sustainable location within an established residential area, in close proximity to local shops, services and schools whilst not detrimentally impacting on the character and appearance of the area, neighbouring amenity or highways safety. The scheme was Approved 9 votes to 2.